We are proud to introduce the Driver of the Month for March 2019, Mr. Aaron Massey. Aaron has been employed with Beacon since August 2017. He is originally from Pioneer, Tennessee. Aaron is married to Elise and has three children: Daniel, Lilly and Amy. He enjoys spending time with his wife and kids. He also enjoys being out in the woods and being upbeat. 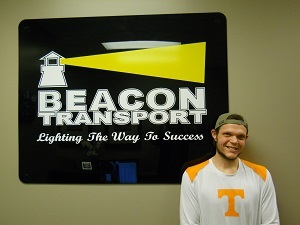 We appreciate the outstanding job Aaron is doing for Beacon Transport.